On this Sunday afternoon, I thought it a perfect time for sharing about the upcoming USPS Forever Stamp Honoring First Responders. This next week, on Tuesday, will be September 11. In the midst of all the talk of a potential hurricane coming this way to the East Coast, specifically to the Carolinas, I am pausing to make sure we know about this stamp. First, the stamp will be available nationwide on September 13, 2018. 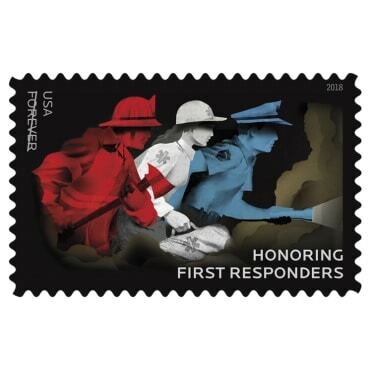 In the meantime, it is available for Pre-ordering USPS Forever Stamp Honoring First Responders. Furthermore, I’m including this from the August, 2nd USPS Stamp Announcement. “With this stamp, the U.S. Postal Service recognizes the men and women — firefighters, law enforcement officers, and emergency medical service professionals — who respond to critical situations with skill, dedication, and uncommon bravery. First responders are found throughout society, from small townships to the federal government, and their ranks often include a wide range of law enforcement professionals and public safety personnel. In addition, the format for the stamp comes on a pane of 20 stamps pressure-sensitive for $10.00. Thank you for joining me today. I’m off to go do some storm preparations around the house! P.S. Our countdown to #1,300 continues; today is daily blog post #1,292 celebrating letter writing! You may enjoy reading this AnchoredScraps post on the Thunder Dog book by Michael Hingson from 9-11-2016.